Only 7 minutes drive from cala canyelles, 10 minutes from the center of Lloret de Mar and 15 minutes from Tossa de Mar in the pleasant and tranquil residential area Serra brava. The villa has a garden grassed and raised, with a swimming pool of 7.50 m. x 3. 75 m, chairs and terrace tables and barbecue at your disposal and also sun loungers for sunbathing. On the ground floor there are two bedrooms, one with double bed and the other with two single beds, a bathroom, the kitchen, and the dining room which gives directly onto the terrace and the swimming pool. in the first floor you will also find two bedrooms and another bathroom and also a large living room well equipped and very comfortable for a good relax. groups of young people not accepted. beaches: there are several beautiful beaches not far, the nearest is 4 km. and it's easy to park the car next to the beach. This is not the best villa we've ever stayed in, but for the price we paid, we thought it was excellent value and met our needs. This property is literally at the top of the hill, so you have views from the pool side towards the sea and views from the front towards the hills and Pyrenees in the distance. The interior of the house is functional, but nothing special with the highlight being the upstairs lounge with views towards the sea. Kitchen is reasonably well equipped with plenty of glasses, plates, cutlery and cookware, more devices than plug sockets is a minor inconvenience. However, the two things that made this a great holiday were the outside areas, with seating front, back and at the sides (you can follow the sun or find shade) and Jean who is a very helpful host providing excellent advice on the area, what to see and where to shop or eat. One other thing to be aware of is that you need a car and that it's a 7 or 8 minute drive to the property from the main road between Lloret and Tossa.. The nearest beach (Canyelles) is lovely if you can park (OK Sept and October midweek, but busy weekends). Difficult to beat for the price and definitely recommended. We were traveling with 10, 5 and 3 years old childs. We got colder weather than in home. I checked from freemeteo that it was coldest week at that time of year at least for 15 years. But house was very nice - just like in pictures. House is at the highest point of hill (300 meter from see level) and there is nice views to see and to Pyrenes. Owner lives in the neighbor and he is very helpfull, but with house we didn't need any help - there was every thing and every thing works. We can recommend this house. It would be good for two families too. Formidable, Maison parfaite avec des attentions pour profiter du confort de chaque pièce. Un grand merci au propriétaire pour son accueil chaleureux, ses conseils pour les visites de la région et une maison parfaitement tenue où on s'y sent comme chez soi. Nous avons passé un séjour très agréable et c'est une adresse que je conseille fortement. Wir haben von Mitte bis Ende Oktober unseren Urlaub in diesem wirklich sehr schönen Haus verbracht. Für diese Jahreszeit war es dort überraschend warm. Wir konnten im Swimmingpool und im Meer baden. Das Haus ist noch viel schöner, als es auf den Fotos zu sehen ist. Uns hat die ruhige Lage gefallen, die Nähe zum Naturschutzgebiet und der Blick sowohl auf die Pyrenäen und das Mittelmeer. Der Vermieter war so nett uns einige schöne Wanderwege, die in der Nähe des Hauses beginnen, mit phantastischem Ausblick zu zeigen. Er ist nett, freundlich und kann viele Tipps geben. Wir haben unseren Aufenthalt genossen und würden jederzeit gerne wiederkommen. 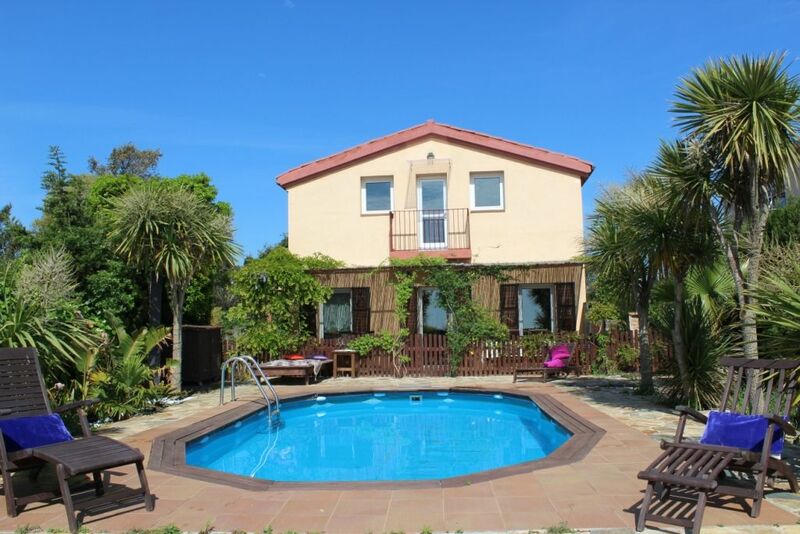 Villa très agréable pour de super vacances! Merçi beaucoup Mr. Guy pour choisir notre villa, et pour votre gentillesse,on aime que nos vacanciers se trouvent le plus confortable possible.